After Thanksgiving dinner, or at other times over the long weekend, you may want to sit back and relax with a glass of liqueur. A bottle of any of these also makes a nice house gift. 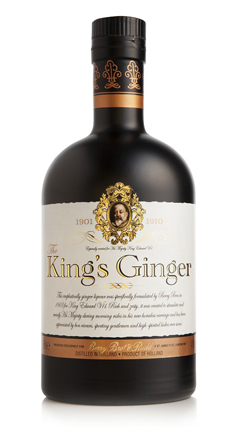 The King’s Ginger was formulated for King Edward VII. But you can enjoy the ginger flavor for Thanksgiving. Photo courtesy The King’s Ginger. If you have cordial glasses (also called liqueur glasses and schnapps glasses), it’s a good time to use them. We actually prefer brandy snifters, which narrow at the top to keep in the aromas. Whiskey tasting glasses do the same thing. You can make your own pumpkin liqueur. All you need is fresh pumpkin, a bottle of 100-proof vodka, sugar, lemon and pumpkin pie spice. Start now: The liqueur needs to distill in a jar for one to two weeks.